The survival horror genre, started by the game 'Resident Evil', is booming. At present there are many games in the App Store that opt ​​for this type of genre, but few are right squarely with its main features. 'Running Dead' is one of those exceptions that surprised the store, getting more than a million downloads since it was released. In this game you can select character and weaponry, considering that our ammunition is limited to what we can glean on our tour. 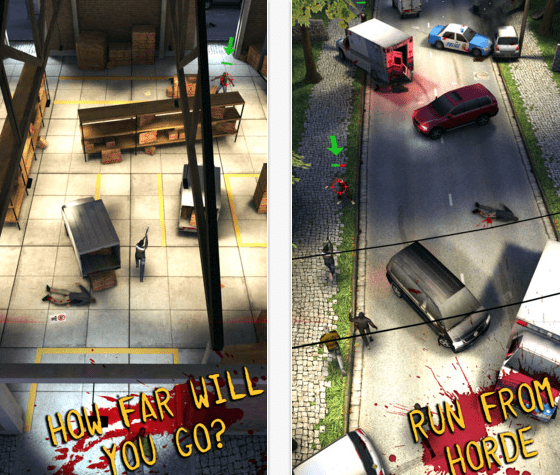 In scenarios flee the zombies chase us, while giving away other enemies, cars and buildings. The controls can be customized to the fullest and are as simple as moving from side to side and shoot the enemies that come from the front. Our goal is to build a level as we run: we have to be attentive to our health (that diminishes when we fall into the clutches of a zombie) and, as in any racing game that boasts, we must prevent the zombies chase us we hunt down, because if that happens: Game Over. You can find 'Running Dead' in the App Store for 0.89 euros. The article 'Running Dead', a survival horror fledged was originally published in News iPhone .